By Verner C. Johnson, Ph. 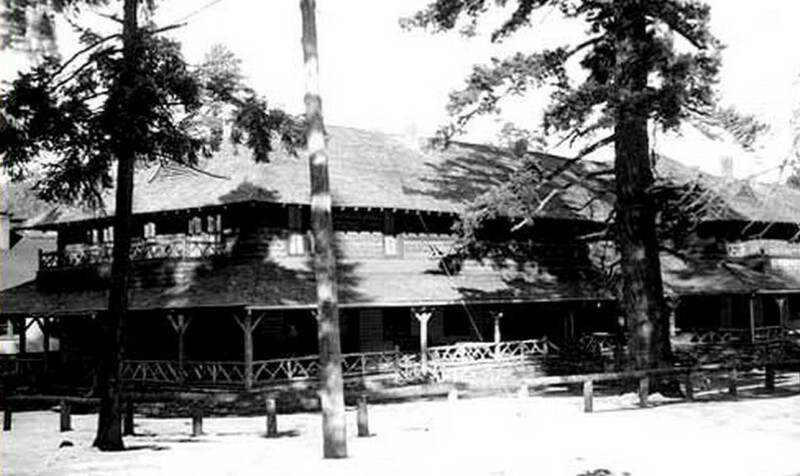 D.
Introduction: The Lodge in Cloudcroft is located in the heart of the Sacramento Mountains, New Mexico (Figure 1), about 20 miles east of Alamogordo. The Sacramento Mountains are elongated mountain range extending 80 miles north-south and 40 miles east-west. The topography of the area is rugged with steep slopes and beautiful canyons. The average elevation is between 6000 – 9500 feet above sea level (Figure 2). The beautiful mountain area is dense with trees, bushes, and shrubs including pine, oak, elm, and poplar. Geology of the Sacramento Mountains, compiled from several sources and field observation is mentioned briefly below. Readers can look into “Related links and information” below for more information about the geology of the Sacramento Mountains and Cloudcroft area. General Setting: Sacramento Mountains are located in the Sacramento Section of the Basin and Range Physiographic Province (Figure 3), known for the range and basin types of surface features that are made up of series of faulted blocks extending from south central New Mexico and southern Arizona to Nevada (Chapin and Cather, 1994). East of the Sacramento Mountains is the Great Plains. The faulted blocks of the Basin and Range were formed by the extension of the crust in the past 65 million years. Important note, the southern part of the Rio Grande River is within the Mexican Highland Section of the Basin and Range Physiographic Province. Geologists believe this part of the area, the Tularosa Basin, was formed from the downthrown block from the crustal extension of the Rio Grande Rift Zone which began approximately 28 million years ago (Seager, et. al., 1984). Sacramento Mountains and San Andreas Mountains are the upthrown faulted blocks at both sides of the Tularosa Basin. The strata in the Sacramento Mountains dip gently from west to east. This type of geological structure is known as the cuestas (Spanish meaning slope) and is an ideal condition for the eastward flowing groundwater though the limestone layers called the artesian system toward the Great Plains. Residents in the Artesia, New Mexico area obtain water that rises through the wells without the use of pumps (Halka, 1987). Geology: The geologic map of the area (Figure 4) shows the rock formations are interested and fascinated to the travelers. The sedimentary layers are mostly massive limestone layers of the San Andreas (Figure 5) and sandstone and shale of the Yeso (Figure 6) Formations. Gypsum layers are also exposed at few places. These formations were deposited in the marine environment during the Pennsylvanian and Permian Periods (about 280,000,000 years ago). Travelers will find sedimentary rocks are sparsely exposed due to the dense vegetation in the area. However, they can observe excellent exposed rock formations along the roads and hiking trails, all within 20 miles radius of Cloudcroft. Many places along the roads and trails do have markers describing geology and rock formations at the observation points. The sedimentary rocks can be observed along the following routes: US Route 82 between Alamogordo and Artesia, New Mexico Routes 6563 (known as Sunspot Scenic Byway), 130, and 244. Travelers should stop at Tunnel Visa at US 82, just west of High Rolls to observe excellent view of Pennsylvanian and older sedimentary rocks and faults (see Figure 7). Excellent views of the Sacramento Mountains and Tularosa Basin can be observed at Nelson Visa and Sunspot (Figure 8) along Sunspot Scenic Byway (New Mexico Route 6563). In several places where the limestone layers are exposed, the travelers expect to see abundant fossils such as brachiopods (Figure 9A), ammonoids (Figure 9B), crinoids (Figure 9C), fusulina (Figure 9D), and corals (Figure 9E). Not shown in photos, bryozoans, gastropods, pelecypods, and cephalopods can also be found in the exposed limestone layers. The readers should see http://www.flickr.com/photos/swregion/sets/72157626665006529/ for more illustrations of the fossils. The area within 20-mile radius of Cloudcroft is truly an excellent hunting ground for fossil hunters and rockhounds. Cloudcroft residences like to pick fossils for their home or landscape decorations. For example, the golf course at the Lodge has limestone boulders around the fairways as parts of the landscapes. Golfers should take the time and check out the boulders for ammonoid and brachiopod fossils (Figure 10). Other places in Cloudcroft such as the church (Figure 11) by US 82 and Instant Karma (Fig. 12) in downtown use fossils as decorations. Ed Woten of Imaginary Books and Collectibles writes articles on geology and fossils in the Cloudcroft Area in the Mountain Monthly News. Readers can find more information by reading Part I and Part II of his Fossils of Cloudcroft article in the Mountain Monthly News. Geologists believe the southern part of the Sacramento Mountains and the surrounded area were part of the marginal marine to marine environment during much of the Pennsylvanian to Permian Periods (Figure 13). The events occurred about 280 million years ago (see SE NM in. http://jan.ucc.nau.edu/~rcb7/perm290seattle.html). The kind of the depositional environment and climate is believed to be similar to the present day Great Barrier Reef, just north of Australia or the Bahamas Islands east of Florida. According to the plate tectonic theory, during Pennsylvanian to early Permian periods, the North America continent began to merge with Africa-Europe to form the supercontinent, called Pangaea, when practically all the world continents became one landmass. Mountains such as Appalachian and Ancestral Rocky Mountains appeared. Within the southern part of the Ancestral Rocky Mountains in New Mexico, a mountain range, known as Pedernal Uplift (Kottlowski and Stewart, 1970) was uplifted. During the early stage of the Pangaea formation, the western part of the North America continent was under the sea (Figure 13). The Cloudcroft area was around the equatorial region. This tropical marine environment is known as the Permian Basin where the climate was suitable for lime to deposit and eventually formed into limestone. The marine life such as brachiopods, ammonoids, corals, and crinoids were flourished and abundant. The environment was also favorable for gypsum to deposit. Series of gypsum layers can be observed in the Yeso Formation (Figure 6). Ron Blakey provides good information about the geologic events during the Pennsylvanian to Permian Periods using paleogeography maps of the Colorado Plateau region. Readers should check out for more information about the Pennsylvanian-Permian events in http://cpgeosystems.com/globaltext2.htmlby Blakey (2001). During late Permian to early Triassic, the western part of North America and South America was uplifted to become land mass and the Pedernal Uplift around Cloudcroft were born. Note: Pedernal Uplift is not the same mountain range as the Sacramento Mountains. Pedernal Uplift appeared during Triassic to Cretaceous Periods. The Sacramento Mountains formed as faulted block from event during the formation of the Rio Grande rifting. Figure 4 shows most of the Sacramento Mountains lack sedimentary rocks of the Triassic to early Cretaceous Periods (pre-Dakota in the north central part of the geologic map in Figure 4). This indicates the area, including Pedernal Uplift was above sea-level and erosion was active (see http://cpgeosystems.com/images/SWNA_180Ma-sm.jpg). Dinosaurs are thought to roam the area. The Dakota Group (Kdg in Figure 4) is made up of sandstone, shale, and coal (?) which indicate marginal marine environment similar to what you see along the Gulf of Mexico coast. Geologists believe approximately 85 million years ago the area was undergoing subsidence from the compressive stress when the western part of the North American Plate was going over the Pacific Oceanic crust. Thus the sea covered most of central USA, known as the Cretaceous Seaway (see http://cpgeosystems.com/images/NAM_key-85Ma_LateK-sm.jpg). The post-Dakota strata may have been deposited but were eroded away during the Cenozoic Era. Geologic map also shows few small intrusions of magmatic origins (Ti in Figure 4) in the western part of the Sacramento Mountains. They are dikes and were intruded during early Tertiary Period about the time when the Rio Grande Rift Zone, a narrow north-south basin structure from central Colorado to Mexico began to appear (see maps in http://nature.nps.gov/geology/parks/whsa/geows/). Tularosa and other basins as well as mountain ranges such as Sacramento Mountains also formed and tilted to the east from the extensional activity of the crust (see Chapter 1 in http://nature.nps.gov/geology/parks/whsa/geows/index.htm). Whether the Pleistocene glaciers were present in the Sacramento Mountains or not is debatable (see http://cpgeosystems.com/namQ.jpg). Allen (2009), however, prepared interesting report about Lake Otero just east of Alamogordo in the Tularosa Basin that occurred during glacial time 45,000 – 28,000 years ago. Lake Otero is known as pluvial lake. Pluvial is a Latin word meaning “rain”. Thus the pluvial lakes were formed at the time during the glacial stages when the climate was moist from heavy precipitation. Pluvial Lakes were common in the Basin and Range Physiographic, including Lake Bonneville, now Great Salt Lake. Perhaps, the meltwater from the glaciers or heavy snow in the surrounded mountains (Sacramento and San Andres) dissolved and transported gypsum into Tularosa Basin forming Lake Otero. Because of the evaporation, gypsum was left behind. The wind blew the gypsum to form sand dunes in the White Sand Dune (Figure 14). The author appreciates the following people who have made this report possible. Staff members of the Lodge provided the author information and places to observe geological features. Dr. Steven Henry of Cloudcroft, a geologist, took me out to the field and showed me sedimentary rocks and faults. Mr. Ed Woten also of Cloudcroft showed me his fossil collection and took me to a place where fossils can be found. People at Cloudcroft Forest Service Office were very courteous and helpful in giving the author information on mines, trails, and geology in the Sacramento Mountains. A special “Thank you” should go to Britt Mathwich and Lisa Thomassie of the Lodge who encouraged and provided the author everything needed for this report. Allen, B. D., 2009, Evidence for late Pleistocene hydrologic and climatic change from Lake Otero, Tularosa Basin, south-central New Mexico, New Mexico Geology, vol 31, no. 1, pp. 9-25. Chapin, C. E., and Cather, S. M., 1994, Tectonic setting of the axial basins of the northern and central Rio Grande Rift, in Keller, G. R., and Cather, S. M., eds., Basins of the Rio Grande Rift: Structure, Stratigraphy, and Tectonic Setting: Boulder, Colorado, Geological Society of America Special Paper 291, p. 5-25. Seager, W.R., Shafiqullah, M., Hawley, J.W., and Marvin, R.F. (1984) New K-Ar dates from basalts and the evolution of the southern Rio Grand Rift; Geological Society of America Bulletin vol 95, p 87–99. Excellent geologic report of the Permian Basins with excellent information on the depositional environment and fossil history is in this site. Readers may like to see pictures of the fossils. Excellent book about geology of New Mexico for the armature travelers is Chronic, Halka, 1987, “Roadside Geology of New Mexico”, Mountain Press Publishing Company. Geologic information of the Sacramento Mountains can be found on pages 192-197.